In the US, you'll sometimes spot a brightly-colored car--exaggerated spoiler included--with flames painted all over the sides and rear. It's kind of a "tough guy" thing, right? Well, this my friends, is the French version. No flames here...just a picturesque village, complete with river, arched bridge, pastoral fields and trees. It's how the "tough guys" roll over the Pond. very funny. 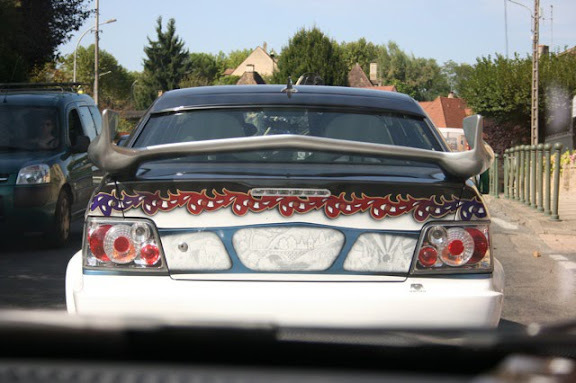 are those regular brake lights? seems like there are a few too many in there. Ha! Someone put a lot of time into that! Not my cup of tea, but whatever floats their boat!